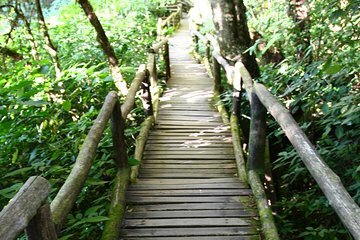 Descubra la cima del jardín de Doi Inthanon en un tour privado de 8 horas desde Chiang Mai y experimente la rica cultura y los impresionantes paisajes del norte montañoso de Tailandia. Explore las pagodas gemelas que rematan el pico de 8,514 pies (2,595 metros) y admire las maravillosas vistas desde sus cuidados caminos. Descienda a un pueblo de la tribu de las montañas para observar las tradiciones distintivas y los vívidos trajes de la gente de Karen, y haga una pausa para comer en un restaurante local. Refrésquese con el atronador Vachiratharn Waterfall, luego haga una parada final en Baan Tawai, un pueblo de hábiles artesanos. The pagodas were splendid and the drive through the country side and the park was beautiful. The stop was not at a hill side Karen village but a road side stand with fruits, vegetables and crafts from the local area. The last stop was not a place to see skilled craftsmen but an area to buy furniture and crafts. Since we are not shoppers we didn't need this stop. Our guide was just average so the day was just average. We really enjoyed the private tour by guide We Chian and our driver Niphon was very good too. We highly recommend this tour for people interested in seeing a lot of what Doi Inthanon has to offer in a short amount of time as the trip to and from will take 3.5 hours in total. The tour guide is extremely engaged and intelligent about what is being seen and experienced. The lunch was also very good. A great day out with lots of interesting things to see along the way and a very knowledgable guide to ensure we didn't miss anything.